It’s International Paloma Appreciation Week (IPAW) from 24th-30th September. So often living in the shadow of the world famous margarita, the Paloma cocktail is itself a Mexican classic, and long overdue some recognition and celebration. It has become a firm favourite amongst Melbourne’s best bartenders and drink aficionados – and, with its combination of tequila and grapefruit, it’s the perfect spring cocktail. 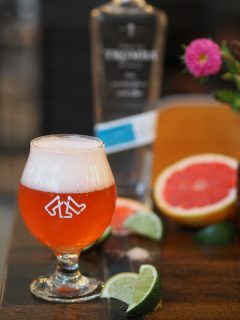 To celebrate this classic Mexican cocktail, and IPAW, independent Melbourne brewery, Stomping Ground, has collaborated with Tequila Tromba to brew a Paloma-inspired German Gose (pronounced “goes-uh”) beer using lime, grapefruit and tequila that is both sweet and tart, beautifully aromatic and completely delicious. Steve Jeffares, co-owner of Stomping Ground said, “Collaborations such as this one, working with Tromba, allows us to have a lot of fun whilst expanding our beer brewing horizons. “We really enjoy taking inspiration from other drink areas, like cocktails, to explore new flavour profiles, but also to engage with an audience that maybe wouldn’t have tried independent beer before.